UGC NET 2018 Detailed Notification has been released now. Central Board of Secondary Education (CBSE) holds the National Eligibility Test (NET) on behalf of University Grants Commission (UGC). Aadhaar Card is mandatory to apply for UGC NET. CBSE UGC NET determines the eligibility of Indian candidates for Assistant Professor or for Junior Research Fellowship & Assistant Professor both. Junior Research Fellowship awardees will be eligible to pursue research in their postgraduate subject from IITs or other national organizations. Such candidates are also eligible for the post of Assistant professor in Indian colleges/Universities. For the year 2018, UGC NET exam will be conducted only one time in a year. Aspirants can read this article further for getting information about UGC NET 2018 including application form, eligibility, exam dates, pattern, etc. 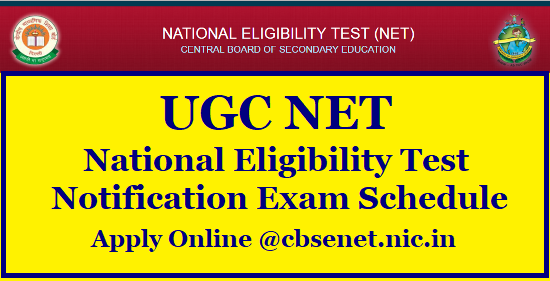 Candidates wishing to apply for UGC NET 2018 have to fill the application form online only on the official website of CBSE NET. The application form will be released from 5th March 2018. No application will be accepted after the last date. Aadhaar card is necessary to apply for UGC NET 2018. The application process will consist of four steps viz. fill the application form, upload scanned photograph and signature, pay the examination fee and print confirmation page. There is no need to send the printout of confirmation page to CBSE. CBSE will also provide the correction facility in UGC NET application form 2018. The correction will be done from 25th April to 1st May 2018. Application fee is payable through credit/ debit card or through e-challan. Candidates submitting the fee through e-challan have to make the payment in cash to Syndicate/Canara/ICICI bank. Qualifying Examination: Master’s or equivalent degree from Universities/Institutions recognized by UGC. Subjects: The qualifying examination must be passed in subjects like Humanities (including languages) and Social Science, Computer Science &Applications, Electronic Science etc. Minimum Marks: The percentage of marks required in qualifying examination is 55% (50% marks in case of SC/ST/OBC-NCL/PwD categories). Appearing Candidates: Candidates appearing for final examinations towards a Master’s degree (or equivalent) are also eligible to apply. Relaxation: Relaxation of 5% marks in qualifying examination shall be given to Ph.D degree holders whose master’s level examination had been completed by 19th September 1991. Age Limit: The maximum age limit is 30 years as on 1st January 2018. Relaxation: 5 years relaxation in the upper age limit will be provided to OBC-NCL, SC, ST, transgender and PwD category candidates. Relaxation will also be given to the candidates having research experience. Candidates possessing LL.M. degree will be eligible for 3 years relaxation in age.